Authorities on the Indonesian island of Bali fear a major eruption of the Mount Agung volcano is imminent. The threat alert has been raised to the maximum level, prompting mass evacuations and stranding thousands of travellers. How likely is it to erupt? Volcanologists have been warning of an eruption at Mount Agung for the past few months, with hundreds of tremors recorded at the site each day. In September, the alert level was raised to the highest possible rating and more than 140,000 people were evacuated as a state of emergency was declared. Activity at the volcano decreased in October and many people returned to their homes, but Mount Agung started rumbling again last week. On Monday morning, a spokesperson for the region’s disaster mitigation agency confirmed that the volcano had shifted into the magmatic phase, meaning an eruption was imminent, and the alert level was again raised. Photographs taken by Indonesia’s state news agency, Antara, have captured a red glow that appears to be magma and ash continues to spew from the volcano. What will happen if it does erupt? When it last erupted in 1963, Mount Agung killed more than 1,000 people and destroyed several villages. A lava flow extended for approximately 7km and fleeing survivors spoke of a “rain of ashes”. The most deadly aspect of the 1963 eruption was the resulting pyroclast flow, a lethal combination of red-hot lava blocks, superheated gases and ash that travelled rapidly down the slopes catching many villagers unaware. Lessons were learned and authorities in Bali put in place a series of precautionary measures to prevent a repeat of the death toll, but no one can be entirely sure what impact an eruption would have today. The volcano is located around 75 kilometres from Bali’s main tourist area of kuta meaning holidaymakers would not be directly affected by an eruption. However, a large amount of ash in the atmosphere could ground flights for some time, leaving thousands stranded. Authorities have also warned people of the danger of fast-moving mudflows, a common occurrence in the event of significant eruptions. A major eruption would likely have a significant impact on the Earth’s climate. When Mount Agung erupted in 1963, sulphur emissions had a widespread cooling effect and global temperatures dipped by up to 0.4C. Authorities in Bali are well-prepared for an eruption and an evacuation zone of up to 10km has been put in place around the volcano. Around 40,000 local residents have already fled the area, and the governor of Bali has said that a further 150,000 could be ordered to evacuate. The island is a hugely popular holiday destination attracting millions of visitors each year, and while Bali’s main tourist resorts are well outside Mount Agung’s evacuation zone, volcanic activity does have a knock-on effect. 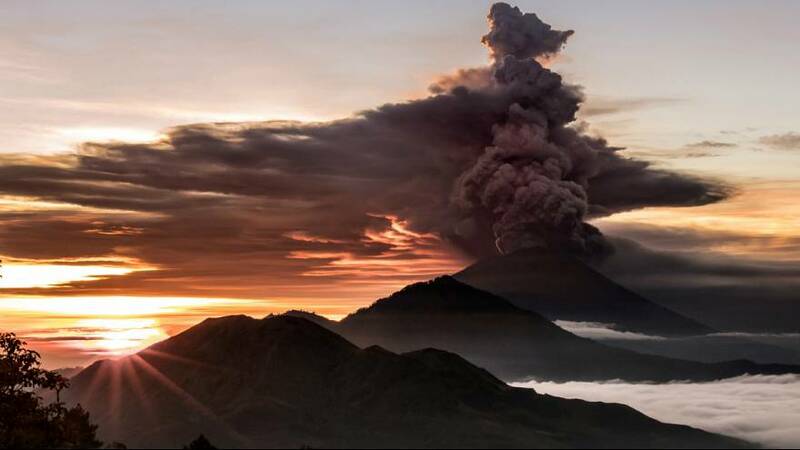 Ash from the volcano has resulted in the closure of Ngurah Rai International Airport in Denpasar for at least 24 hours as a precautionary measure. Reuters has reported that 445 flights have been disrupted so far, impacting around 59,000 passengers. Most of the tourists affected are Australian, but the TASS news agency has said 300 Russian tourists are currently stranded and will be evacuated to neighbouring islands. An airport spokesperson said the situation would be reviewed every six hours. Indonesia sits on the Pacific Ring of Fire, and is home to more than 120 active volcanos. Eruptions are frequent. In 2010, Mount Merapi in Central Java erupted, resulting in the deaths of 350 people and the evacuation of 350,000 more. In recent years, significant eruptions have occurred at East Java’s Mount Raung and Mount Sinabung on Sumatra, a volcano that had previously been dormant since 1600. One of the most famous eruptions in modern history occurred at Mount Krakatoa in 1880, where a series of huge explosions almost destroyed the island and could be heard more than 3,000km away. The death toll recorded at the time was 36,000, although some sources claim that up to 120,000 people may have been killed, and global temperatures fell by as much 1.2C in the year following the eruption. A supervolcano eruption at Lake Toba in Sumatra 75,000 years ago is the largest known volcanic activity within the last 25 million years. Evidence suggests that the resulting volcanic winter lasted for six years. Mount Agung plays a central role in the people of Bali’s culture and Hindu beliefs and is the most sacred mountain on the island. Legend has it that the gods looked down on Bali and saw it as an untethered island floating in the ocean. Mount Agung was their gift, an “anchor” that would make Bali stable and hold everything together. Every 100 years, the people of Bali hold a purification ritual at a temple perched on the side of the mountain, a ceremony designed to pacify the gods and prevent disasters befalling the human race. The most recent ceremony was due to have taken place in 1963, just before Agung’s last eruption. The priests of the temple took the volcanic activity as a sign that the ceremony should not go ahead. However, the president of the time, Sukarno, had planned for a group of foreign dignitaries to witness the ritual and insisted that it proceed. The devastating eruption of 1963 occurred shortly after and the people of Bali considered it a reflection of the wrath of the gods, angry that the cleansing ceremony had not been conducted properly. Remarkably, the temple itself escaped the lava flows and remained unscathed.